The legends of 1970′s British comedy had brought in record audience figures, but a new wave of comedy talent stemming from the Comedy Store in London was about to change the whole scene. 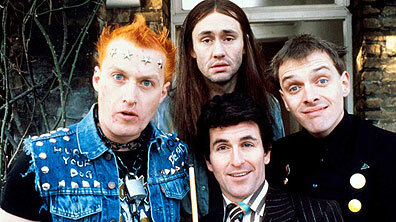 Their influence on British comedy was to last for decades to come and is still felt today. While music at the time was relatively establishment, so was comedy. The talents of Morecambe and Wise or Les Dawson were incredible, but they were not subversive. With the new, neo-conservative politics of Margaret Thatcher and a Britain suffering from mass unemployment, crippling strikes leading to rubbish piled high on the streets of London and dying industries, people were angry at the powers that be. Against this backdrop, anarchic punk-bands emerged challenging the comfortable. At the same time, just like in the 1970s, comedy mirrored the music scene and giving birth to a type of talent that would storm the world and came to be known as an Alternative comedy. That’s not to say they were popular with the 1970s crew, who deemed Alternative comedy as comedy without being funny. Another reason behind Alternative comedy was as a reaction against some of the established comedians at the time. Many, like Bernard Manning, would perform racist and sexist routines, and Alternative comedy set out to distance itself from that prejudice. While the 1980s saw a new wave of alternative comedians, it also saw women burst into the mainstream with Dawn French and Jennifer Saunders being bigger than any others. Meeting in higher education, they lived together and performed gags with their flatmates, who the pair said must have been totally sick and desensitised to them. They would, for example, allegedly drop a manikin from a rope into the window below. They performed on stage for many years with John Cleese of the classic Monty Python and Fawlty Towers saying they were the best comediennes he’d seen. Eventually, they got their own sketch show where they would parody everything from Titanic to The Silence of the Lambs. Their comedy would often parody their cinematic and TV targets, but at the same time break the pretence and pillory their own comedy careers. Yet, beyond their work together, they would have an extraordinary impact on comedy. French would be the main star in The Vicar of Dibley, a sitcom about a vicar in a small village in England, while Saunders would write and star in Absolutely Fabulous – a sitcom that originated from a French and Saunders sketch with Saunders playing Edina, the mum (just as in the series) and French playing the daughter. Officially the double act is now retired, but they’ve already reformed for a charity sketch parodying Mamma Mia. Recently, they’ve been seen in new episodes of Absolutely Fabulous and Dawn French starring in the brilliantly dark comedy Psychoville. A writer and performer, he would co-write two of the greatest British sitcoms of all time – Blackadder – a historical sitcom based before the French Revolution, medieval England and British trenches during World War One – and The Young Ones – a surreal sitcom about a four students; a hippie, an anarchist, a punk and a kind of east end of London gangster. Both sitcoms would be unpredictable and irreverent, but he also performed live at the Comedy Store and on Channel 4’s Saturday Live, highlighting his left-wing ideology and anger at whatever flew in the face of his beliefs – Margaret Thatcher being a prime target. In later years, he wrote the musicals We Will Rock You based on the songs of Queen and co-wrote Love Never Dies, the recent sequel to The Phantom of the Opera with Andrew Lloyd Webber. Elton has come in for much criticism from other comedians for allegedly betraying his ideology and entering the mainstream – working on musicals, writing books and so on – but his huge works continue to be enjoyed. His best work was in his sitcoms, rather than his stand-up. Here is a scene from The Young Ones, showing a left-wing hint and two prominent actors of Blackadder – Stephen Fry and Hugh Laurie (another double act that would go on to do great things, including being ‘House’) in a very early TV appearance for them as well as Ben Elton himself. The sketch parodies University Challenge, a quiz show for universities still running. Watch out for the chocolate éclair. One of the kings of sketch comedy to this day, Harry Enfield properly broke into the public’s radar on Saturday Live performing as a ‘yuppie’ – a young urban professional. Yuppies were characterised as being, for example, bankers flash with cash, downing champagne, driving sports cars and just generally flaunting their wealth with disregard for the poor. His character would wear a track suit and wave a huge wad of cash, shouting ‘loads of money’. He went on to star in Harry Enfield and Chums where smash hit characters like Kevin the teenager, the Tory, the dad with a gay son trying not to accidentally say anything un-politically correct, the slob parents and the cheesy old-school DJs of the previous decades would embed themselves in popular culture, quoted in every household and office. Also starring in the show was Paul Whitehouse, described by Johnny Depp as one of the greatest actors. Later Depp would star in a sketch on The Fast Show, a sketch show with Paul Whitehouse and Whitehouse would star in Tim Burton’s Alice in Wonderland as the March Hare, keeping that connection going. Enfield would also voice several characters on the satirical show Spitting Image, which saw grotesque rubber caricatures as puppets, parodying the celebrities and politicians of the day. It was huge in the 1980s, drawing in enormous audiences. It was sharp, smart and anarchic and became famous for satirising the Thatcher government and the Labour party opposition. Enfield has recently starred alongside Whitehouse again after a long feud. The new show, Ruddy Hell it’s Harry and Paul, is another sketch show, but manages to be as fresh, original and brilliant as the previous one. Here’s a clip of the original Enfield sketch show starring his teenage character, Kevin. Marxist, surreal and with strong anarchic comedy sensibilities, Alexei Sayle starred as the landlord in The Young Ones. He also starred in his own show, a show that ended up being cancelled, called The All New Alexei Sayle Show on BBC Two, notable for being written by the creators and writers of the legendary Father Ted; Graham Linehan and Arthur Matthews. It was their show just before Father Ted and its failure meant they needed a hit quick to stay in the business. Fortunately, Father Ted stepped in and fulfilled its role. Alexei Sayle broke through at the Comedy Store in London with his aggressive, profanity strewn style commenting on lifestyle. He wasn’t an upper or middle class figure and unashamedly so, drawing on his life and background. He had many other TV shows and influenced several comedians down the line, including another left-wing comedian Mark Steel. He was a comedians’ comedian and epitomised Alternative comedy. Here he is at the Secret Policeman’s Ball, with an interview with him from a few years ago. Breaking through on ITV’s New Faces, a talent show in the 1970s, she was a regular act on That’s Life!, a big consumer affairs show that resulted in many ‘watercooler moments’ of the day, not least because of their piece about a driving dog. Unfortunately, her career tailed off, but she’d soon be back. In her career, she’s written and starred in the much loved sitcom Dinnerladies, the bafta-winning drama Housewife 49 and produced and starred in Morecambe & Wise, a one-off drama about the legendary double act. She’s also mastered standup comedy. Really, she was more in the vein of traditional comedy, while still fresh and solid, instead of an Alternative Comedian. In the industry, it feels like she hasn’t got the recognition she deserves with the big wigs. Regardless, she’s brilliant. So what do you think of these comedians? Have we missed any of your favourites?